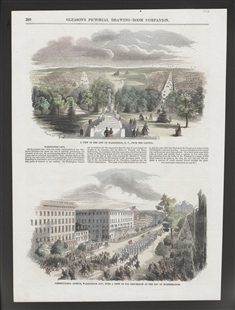 On the occasion of an 1853 presidential inauguration, Gleason’s Pictorial Companion published several views of the capital city. 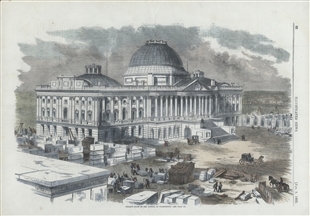 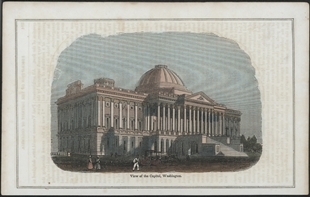 In this print, the western view from the Capitol shows sites of interest. 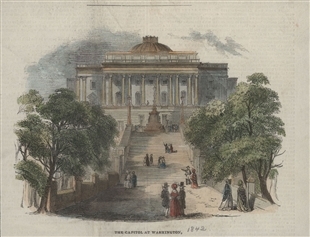 Maryland Avenue to the left and Pennsylvania Avenue to the right are described as the best places to see “politicians of every grade and men of every rank and condition, all hurrying to and fro.” In contrast, ladies and gentlemen of leisure stroll the grounds of the Capitol and admire the Tripoli Monument, the first public monument in Washington.